Hello, I am Naonori Enya. I come from Nakano, Tokyo. I graduated from Nihon University. I aimed at the editing of the publishing company, but my dream was shattered. 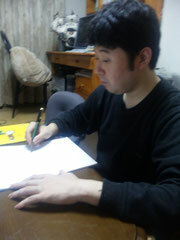 After graduation from University, I entered the small and medium-sized enterprise. I was engaged in a business job. Now, I am University staff at the office of Research Fund Spport Division, Research Promotion Department, ●●●●● ●●●●●●●●● of ●●●●●●●●●●. (industrial management) in Nihon University college of Economics. I want to continue an effort and diligence every day while I believe myself, and having earnest passion. a smile and thanks at any time. The times is in the information revolution that enormous information goes over the border instantly. This trend will progress remarkably in future. However, there is the thing which does not change even if the times revolutionize it so much. It is a relationship of mutual trust as the person of the everlasting. I think that it is the most important as a human being. I want to be so.